About WorldMedic | WorldMedic Information & Technology Co., Ltd.
WorldMedic has enjoyed rapid, worldwide growth during its first five years in business. We have earned a considerable reputation for quality in developing and building our energy projects, and we have demonstrated efficiency and responsibility in managing them. WorldMedic cares about long-term relationships, not short-term results. We deliver quality business solutions and support services based on a combination of our clients’ needs, our previous experience and the latest technology available. WorldMedic accepts corporate accountability for the quality of our clients’ needs, our previous experience and the latest technology available. We believe the best ideas come from creative collaboration with our customers and each other. We create powerful solutions with our customers by applying leading products and services to theirs needs in new and innovative ways. We achieve the greatest results for our customers when we actively identify and capitalize on the opportunities created by the advancement of health care. Our WorldMedic team makes a commitment not to allow business situations – in any form – to undermine or weaken our standards for integrity in dealing with employees, customers, or the communities we serve; integrity epitomizes the character of this Company. WorldMedic is a winning team of talented people, managed through deliberate consensus, deriving expertise from all levels of the company; our people are motivated – and rewarded – as they contribute to this team and to increasing long-term value for the Company. WorldMedic actively nurtures a culture in which our employee entrepreneurs can thrive personally and professionally, enhancing creativity in every discipline of the company; we encourage our people to utilize intelligence, intuition, and information to promote innovation, increase speed to market, and create value. WorldMedic is a leading medical Information and Technology provider supporting the health-care industry since 1997. WorldMedic companies develop, Medical Software, Medical Application, CME System, Medical market, Clinic Online, Medical Service, Medical Consultant, e-Business Technology,e-Training,e-Learning,e-Marketing,Exhibition, Cyber Office, Doctor Network, Mobile Medicine and market products for patient care; develop drug-delivery technologies; distribute pharmaceuticals, Medical laboratory supplies; and offer consulting and other services that improve quality and efficiency in health care. In 2008, the 10th anniversary of WorldMedic Information & Technology Co., Ltd. We move beyond to the next step of technology and business. We prepare to be listed in MAI (Market Alternative Investment) in 2010. In 2008, WorldMedic will launch new business to link with core business that make us to be ” The number one of medicine and healthcare” in Thailand and the leader medical information and technology in the world. WorldMedic is committed to contributing positively to the quality of life in the communities, societies, and cultures where we operate; the continued, sustainable development of the economic, societal, and environmental health of these communities is a key priority for the company and its employees. We were founded in 1997 as WorldMedic.com. Today, WorldMedic is a International medical and health-care services provider that applies vast resources, knowledge and expertise to help our customers — from health-care manufacturers to providers of patient care — meet their most pressing challenges. Our founder, Isaraphong Grangkraw, has led the company’s transformation and serves today as WorldMedic’s President and Founder. Now WorldMedic Information & Technology Co., Ltd. early years were spent growing its position in medical consultant, and the company eventually became a strong regional player. WorldMedic Information & Technology Co., Ltd. Focusing entirely on pharmaceutical fields, Medical Device, Medical Organization, Etc. Today, WorldMedic provides an integrated offering of leading, innovative products and services to help customers across health care meet the growing challenges of a dynamic industry. WorldMedic is a leading medical Information and Technology provider supporting the health-care industry. WorldMedic companies develop, Medical Software, Medical Application, CME (Continuing Medical Education), CPE (Continuing Pharmaceutical Education), CDEC (Continuing Dentist Education Center ), CNE (Continuing Nursing Education), CMTE (Continuing Medical Technology Education) Etc., Medical market, Clinic Online, Medical Service, Medical Consultant, e-Business Technology,e-Training,e-Learning,e-Marketing,Exhibition, Cyber Office, Doctor Network, Mobile Medicine and market products for patient care; develop drug-delivery technologies; distribute pharmaceuticals, Medical laboratory supplies; and offer consulting and other services that improve quality and efficiency in health care. In 2005 we provide medical solution to Healthcare Ministry in part on eLearning, Aids Data Center. Cooperated with Thai Health Education Department(Thaihed). WorldMedic launch initial business, medical website and medical technology. WorldMedic are medical technology provider to healthcare and medical organization. WorldMedic are Continuing Medical Education Provider (CME Provider). WorldMedic are Continuing Pharmaceutical Education Provider (CPE Provider). WorldMedic are Continuing Nursing Education Provider (CNE Provider). WorldMedic are Continuing Dental Education Provider (CDEC Provider). Introduce SmartClinic v.2.0 to physician clinic, poly clinic, special clinic etc. WorldMedic are Continuing Medical Technology Education Provider (CMTE Provider). WorldMedic are Continuing Physical Therapy Education Provider (CPTE Provider). Introduce SmartClinic v.3.0 Plus to physician clinic, poly clinic, special clinic etc. Introduce SmartClinic v.4.0 Standard to physician clinic, poly clinic, special clinic etc. Introduce SmartClinic v.4.0 Network to physician clinic, poly clinic, special clinic etc. Introduce SmartClinic Xtra to ANC clinic,Gyne clinic, special clinic etc. Introduce SmartClinic Nice to Aesthetic clinic, Plasticsurgery clinic, Cosmetic clinic, Special clinic etc. SmartTB for hospital collect Tuberculosis patient data and management. SmartDM for hospital collect Diabetes patient data and management. 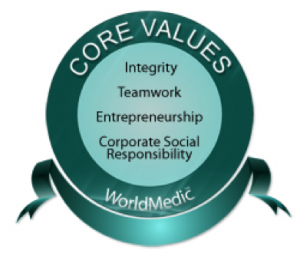 WorldMedic serves pharmaceuticals and medical products company, as well as those who care for patients. For health care manufacturers, we offer product development, manufacturing and packaging services; distribution services; and marketing and sales services. For health care providers, we offer similar services along with an array of products and services that help improve operational and clinical performance. We work in partnership with pharmaceutical and biotechnology companies to develop solution for their organization,consulting and promotional programs with community pharmacies and acute-care providers. For hospitals and other health care providers, we develop technology, as well as automated supply and pharmaceutical dispensing systems and we provide systems to help customers streamline purchasing and inventory management. We help retail pharmacies market themselves in their communities through Internet-based programs and patient-education activities, and we provide systems to help them maximize reimbursement from third-party payers. We also provide franchise opportunities and other services to retail pharmacies. Our operations and clinical improvement services include unique consulting and information systems to help health care providers reduce supply costs, improve operational efficiencies and enhance clinical outcomes. No.1 Ramindra 42/1 WorldMedic Bldg. Ramindra Rd. Kannayao Bangkok 10230 Thailand.